Hubert H. Humphrey: A Biography, by Carl Solberg. The Hubert H. Humphrey papers are organized into over 60 series, with each series detailing various aspects of his life and career. These papers cover Humphrey's service as Minneapolis mayor (1945-1948), his first tenure as United States Senator from Minnesota (1949-1964), his service as Vice President of the United States (1965-1968), his presidential and senatorial campgaigns, as well as materials pertaining to his family and personal life. The series related to sound recordings and speeches contain extensive digitized content. Hubert H. Humphrey was a deeply influential politician on both the Minnesota and National stage. He served as the mayor of Minneapolis, a Democratic Senator, and as Vice-President during the Lyndon Johnson administration. 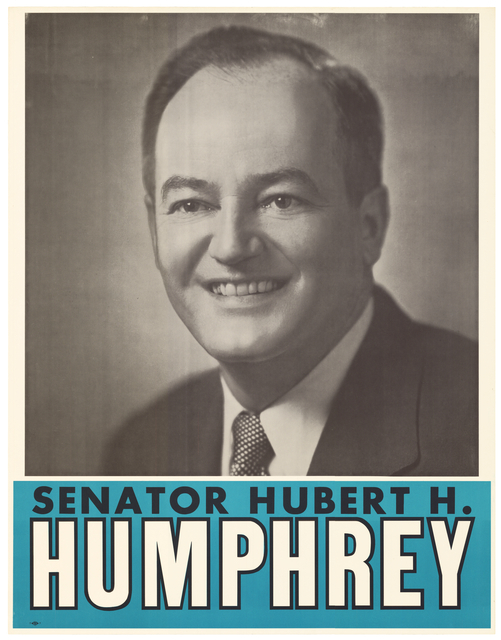 Humphrey ran for President himself three times: in 1960, 1968, and in 1972. Throughout these bids he passed multiple legislative achievements in the United States Senate, and continued to serve in the Senate until his death in 1978. Humphrey is perhaps best remembered for his work on Civil Rights. In 1948, while mayor of Minneapolis, the city enacted the nation’s first municipal fair employment law. Humphrey continued his vocal support of civil rights in a fiery speech at the 1948 Democratic National Convention, contributing to the party’s adoption of civil rights as part of its platform. Humphrey served a Democratic Senator from 1948-1964. During this time, he introduced and supported legislation on issues such as civil rights, food stamps, nuclear test ban, and the Peace Corps. He served as Vice President to President Lyndon Johnson beginning in 1965, and ran for President on the Democratic ticket in 1968. Humphrey's stance on Vietnam was unpopular with primary voters, and his nomination as the Democratic candidate for President in 1968 was overshadowed by anti-war protests and riots during the Democratic National Convention in Chicago. Humphrey ultimately lost the Presidency to Richard Nixon. He returned to the Senate in 1970 and continued to serve as a Senator from Minnesota until his death in 1978. Humphrey donated his papers to the Minnesota Historical Society in 1973. Researchers may access his papers, as well as other related collections, to better understand Hubert Humphrey’s life of service. For more information on Humphrey’s personal papers, visit the “Primary Sources” section of this guide. Other materials related to Humphrey’s life, such as books, articles, images, or films, are cited throughout this guide.